In my house, we like quite a few things. When we aren’t on the road or traveling, our favourite things are family game night and taco night. As our family moves into the new year, we have talked a lot about resolutions. Mine is to make sure we have a family game night at least once a month. 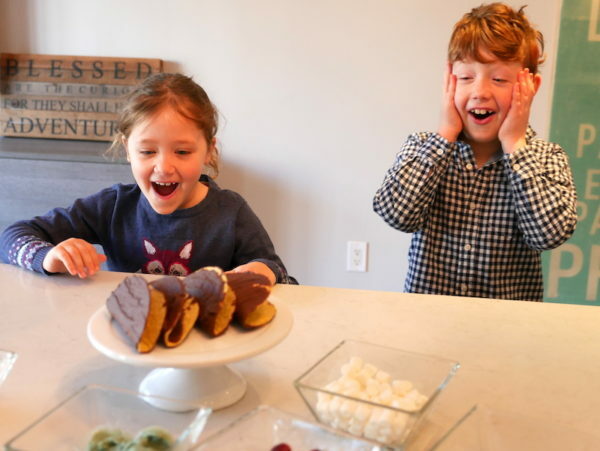 Here are 6 easy tips for a successful family game night plus the ultimate family game night recipe: Ice Cream Tacos with Old El Paso. When people think family game night, I find that they often start too late. My kids are 8 and 6 and our family game nights tend to start around 4 pm. The reason is simple, we can get to at least 4 games before their regular bedtime. Tired kids don’t always make for the best game players. Before we sit down to our first game, I have already prepped dinner. The reasoning is simple. I don’t want to miss out on any games! I find that for us, tacos have the highest success rate for a family game night. This is twofold. My kids have never ever complained about having tacos and it’s a sit down together as a family kind of dinner. While my kids are traditionalist and prefer an Old El Paso beef taco, for more adventurous families there are plenty of amazing slow cooker options like these slow cooker pineapple pork tacos. To make dinner work, we break after our second game and gather in the kitchen as a family. The kids remove all the pre-cut toppings from the fridge and set the table. I grab an Old El Paso Dinner Kit and start cooking. While I prepare the taco meat, I also warm the taco shells and our favourite Old El Paso Mini Tortilla Bowls. In about 15 minutes, we are ready to eat and discuss which game is next. Planning a successful family games night involves choosing the right games. I find that if you are doing a monthly games night, you need a healthy rotation of games. We often reach out to our neighbours and friends before family games night to see which games they love and arrange to borrow some. We like to try a range of games from classics like Sorry to laugh out loud games like Pie Face Challenge. Just because it’s family games night that doesn’t mean you should always restrict the guest list to just your family. We like to invite friends over and find that it helps to liven up the night with fun conversations of favourite games. We play games that pit the kids against the adults for an even more fun atmosphere. My only rule is that everyone who comes plays which you may have to explain to some adults beforehand. I find that leaving what my kids deem as the “best games” for last tends to make the night go smoother. Boom Boom Balloon and Pie Face Challenge are their absolute favourites. I like to keep those options off the table until after dessert. It gives the kids something to anticipate which means that if they aren’t so into one or two of the games, they still tend to hang in there. Besides birthdays and holidays, I can’t really remember a night that we have had dessert in this house in the past year. Still, family game night is the perfect time to break the rules and have fun with food as a family. 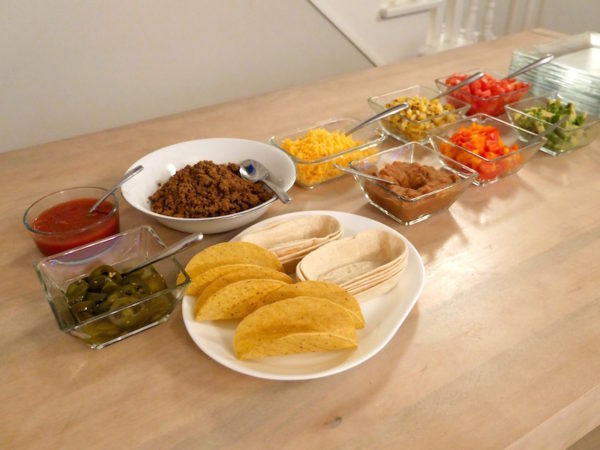 My favourite thing to do is to follow up taco night with a surprise taco ice cream bar. 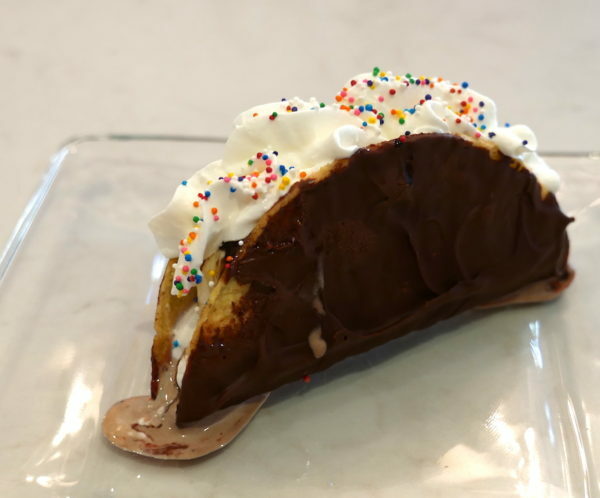 What I love about ice cream tacos is that you can make them as simple or as elaborate as you would like. You can also prep everything ahead of time. Plus, I’ve never seen my kids more excited for food as the night I made them the following recipe. Heat oven to 325ºF. Place taco shells on pan and bake 6-7 minutes until crisp. Melt chocolate chips using a double broiler. Bring an inch of water to simmer in a saucepan. Set heatproof bowl or double broiler on top of saucepan. Stir chocolate as it melts. Remove bowl from heat. 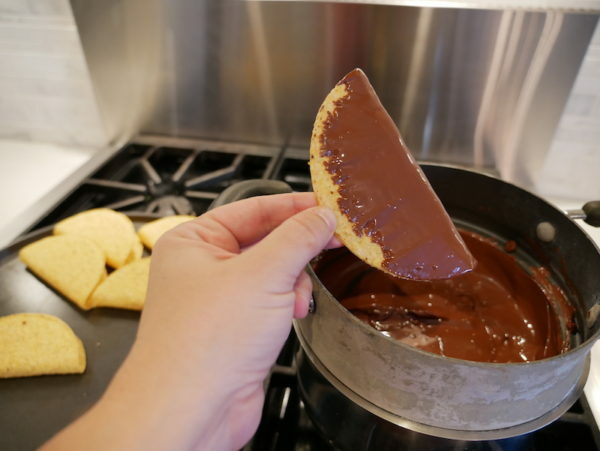 Dip taco shells one at a time in melted chocolate. 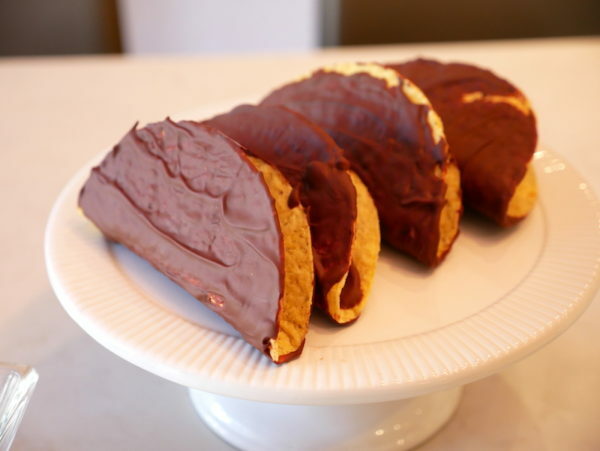 Use spoon to spread chocolate inside of taco shell. Let excess chocolate drip off taco shell and then stand the shell upside down on a platter to cool. Repeat with remaining shells. Place upside down shells in the refrigerator to set for 20 minutes. Set up toppings, ice cream and whipped cream in separate bowls on a counter or table. Remove shells from fridge. Invite family members and friends to assemble ice cream tacos as they desire. This recipe can be tailored as needed to fit every member of the family. Charlie, my youngest, is allergic to dairy and we are able to still make this recipe using our favourite dairy-free ice creams and coconut whip cream. Check the organics section of your local grocery store to find dairy-free chocolate chips. Want to Win Your Own Family Game Night Starter Pack from Old El Paso? 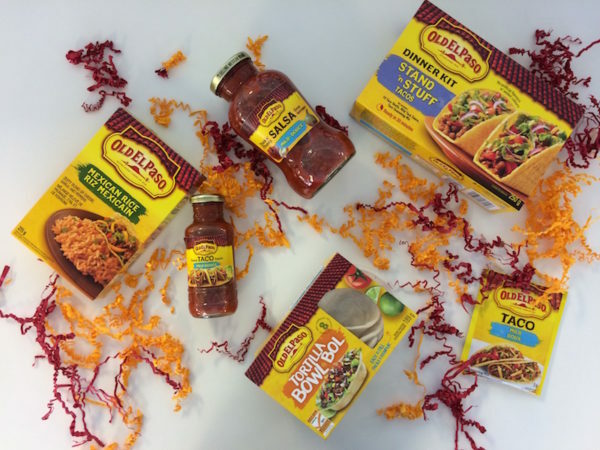 Enter here before February 24, 2017 to win a prize pack valued at $175 which includes a $150 gift card to Walmart and the following Old El Paso products: Regular Tortilla Bowls, Stand n Stuff Taco Dinner Kit, Mild Taco Sauce, Taco Seasoning, Thick n Chunky Salsa Mild and Mexican Rice. Canada Only. No QC. I would have to say mine is “Sorry”. 🙂 Thanks! We play tons of board games and my favorite is always changing. Lately I’m enjoying Payday the most. My favourite board game is Trouble. I have always enjoyed the classic “monopoly” but my favorite would be “rummy-o”, even though it’s not exactly a board game. All kinds, as of late Chutes & Ladders. Does anyone remember “poleconomy”? I need to find it it and see if it’s still as great as I remember. My favourite board game is Yahtzee, it’s fun, fast, reinforces math skills and uses strategy. oh my gosh first of all clever idea with your taco shells. Never would have thought of that. Such a different and fun way of eating them. My favourite board game is Twister. My favourite board game would have to be Scrabble, been playing for it for years. My favorite board game has to be Monopoly. We play alot of board games at the trailer – great for family time! My favourite board game is Monopoly! My favourite board game is Monopoly!! When I was a kid it was Don’t Wake the Dragon! Oh how I miss this game! But now it would have to be Sorry! I love playing it with my niece. The game of LIFE is my fave game! I’m currently obsessed with Pandemic Legacy! My favorie board game is RISK. I love Carcassonne, but it is complicated for my younger ones so as a family board game we are fond of Labyrinth. My favourite board game is Scrabble, but I’ve been playing it online for a while now and I think it would be weird to play it on the board again. My favourite game is settlers of Catan. My favorite board game is Monopoly! I love playing this game with the kids. My favorite board game is CLUE. I enjoy playing The Game of Life. We love the game trouble. Our favorite family game night game is Life. My favorite is Scrabble! I love vocabulary, and I never get tired of this game! My favorite board game of all time is Monopoly! monopoly is my absolute favorite board game. My favorite board game is Ticket to Ride. My favourite board game is Sorry! I like the taboo board game the best. My favourite board game is Scrabble! Monopoly is my favourite board game! I’m hoping Boggle counts as a board game or Yahtzee, we love so many! Scrabble! is my favourite boardgame! We love playing cards or Clue. My favourite board game is Trivial Pursuit. My favorite board game is still Monopoly. We like to play crib. Good luck to everybody on winning a Game Night Starter Pack! I like playing PayDay with my kids. My favourite is Monopoly. I love to play it with the kids, it can get pretty crazy! Our favorite board game is monopoly! My favourite board game is Say Anything. I love Trivial Pursuit. Thanks for the chance! My favourite board game is scrabble. My favourite board game has to be Monopoly. All those great family times! My favourite board game is Scrabble. I’ve never won, but I really like thinking up cool words. Scrabble is an all time fave. Monopoly is a fave old skool but still cool board game of mine. My favorite board game is RISK. My favourite board game has to be Monopoly. Oh I love SORRY and so do the kids! It is simple and quick! snakes and ladders is my fav board game! @sandypeachy1 DeanyPatchy Sandy on fb. LIFE is my favourite board game. My favorite board game is Trivial Pursuit! My favorite board game is Risk; it is such a challenge especially with a big group of people! Scrabble is one of the funnest games to play at our house – you never know what words the kids will try to use 🙂 We also love blokus, which is a strategy game. I like Scrabble and Jenga. My favorite is Parcheesi . spent many happy time playing it with my mom and little brothers. Monopoly will always be my favorite!! My favourite board game has to be the Game of Life, but I haven’t played it in forever! My all time favourite board game is Monopoly, and lately I have been really enjoying playing Scrabble with my older daughter. 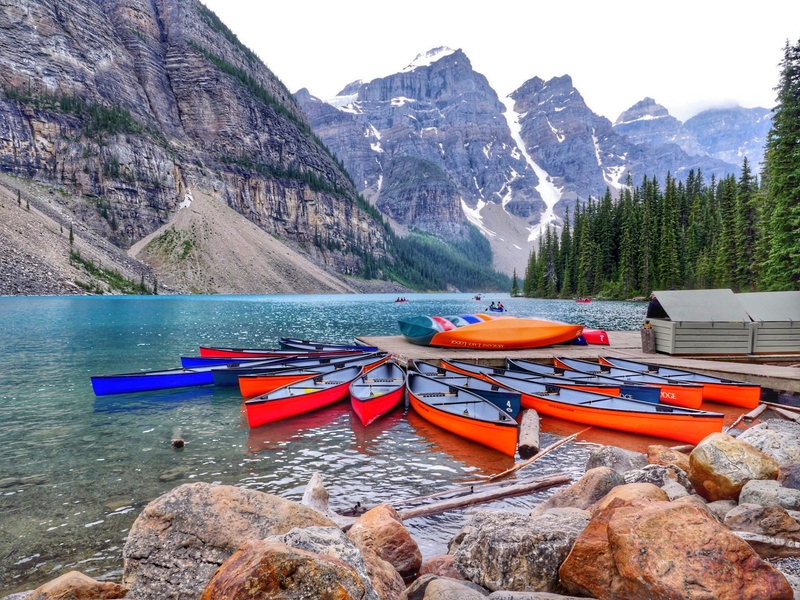 We love Yahtzee because it’s so easy to travel with & has been around forever! Such a classic! We play at home & when we go camping, my daughter loves it. Checkers for the King, Queen and Prince in our home. Yet to be victorious ! We happen to really like aggravation. Our favourite board game at the moment is Machi Koru. My favorite board game is Boggle. Sorry! is my favourite board game. I like the Ice Cream tacos, perfect for my grandkids and us. The grandchildren would have fun with this recipe. 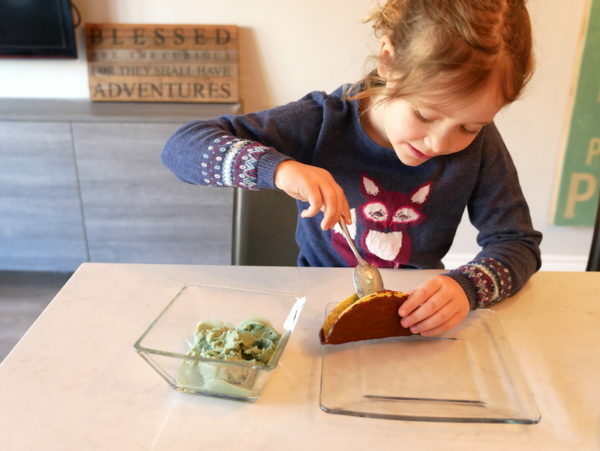 I love this ice cream taco idea, my boys will love these! Such a great idea! We all have a sweet tooth in our family so I am sure they won’t be mad if we use our taco shells for this! Yum!